Are you happy with your current finances? Do your financial goals seem possible? A few years ago, I got fed up with our financial situation. It felt like we were always spinning our financial wheels and never getting anywhere. We needed to save money. We wanted to live better instead of from paycheck to paycheck. It took small action steps to get results, but those small steps moved us in the right direction. 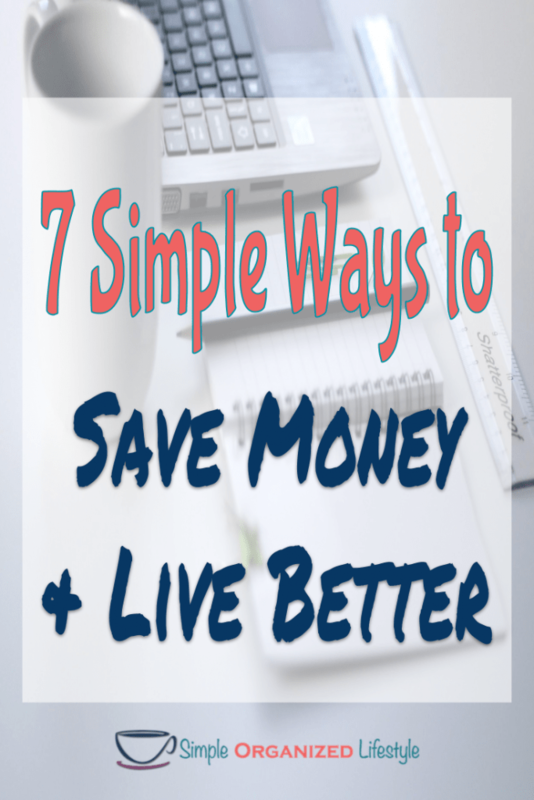 I’m sharing the simple ways to save money and live better that we took to change our finances. They work for everyone and the results are so worth it! It’s amazing how much money we leave on the table by not comparison shopping or negotiating. Shopping smart can be just making a simple phone call that puts more money in your bank account. If you have credit card debt, call to ask for a lower the interest rate. If that company refuses, start searching for a good transfer balance option. Before signing a contract with a cell phone provider, see what other options are available. Compare insurance plans including home, health, auto, and life. You can give yourself a raise with just a little time spent on research! Sometimes simply changing where you shop changes how you shop. For example, if you start buying clothes at an outlet store that cost less than the retail store, you’ll start going there first and saving the difference over time. If you get used to finding items you want at a lower price, it almost becomes a challenge. That is one challenge worth taking! Any time you seize the opportunity to shop smart, it’s a simple way to save money and live better. The people who are paid to sell us on upgrades are very good at their jobs. They know all of the features that appeal to consumers when making the choice between the more affordable product A or the more appealing product B. Resist upgrades now so you can get yourself in a financial position where you can afford the appealing product later. My husband has a great strategy for resisting upgrades. He was telling me about some of his co-workers who recently bought brand new trucks. Truck envy started creeping in… until he ran the numbers. The cost of one of those brand new trucks was equal to an entire YEAR’s salary. When you buy something and think about the hours, months, or even years it takes to make that kind of money with your job, suddenly that “thing” does not seem so appealing anymore. Resisting upgrades is not a punishment. When you save the money to improve your financial health, you’ve made a decision to pay yourself. You’ve really just given yourself a life upgrade! Food can easily turn into a budget buster. Sometimes convenience can be costly. Save more and live better by cooking at home and eating healthier. Eating healthier at home doesn’t mean that every meal is made from scratch with organic fresh foods. 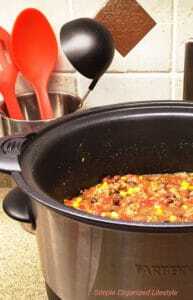 It may mean that you’re eating a hearty, simple crockpot soup instead of a Big Mac. Another benefit of eating at home is having leftovers to take to lunch. That saves money and simplifies the work week. Full disclosure, my family of three eats meals from a fast food restaurant at least twice a week. However, we know what to order that’s somewhat healthy and under $10 for all three of us. For example, at one restaurant we order two chicken sandwiches and one kid’s meal. We bring it home and add drinks, a salad and/or vegetable with our sandwiches, and our son eats the kid’s meal. This works for our family’s lifestyle and budget. Speaking of a budget, if you really want to change your finances by saving money and living better, you have to figure out where your money goes. Once you know where your money is going, you can look for ways to prioritize necessities and cut the non-essential. Some people view a budget in the same way that they view a trip to the dentist. However, a budget is actually the key tool to help you save more and live better. It puts you back in control of your money instead of the other way around. Think of a budget as the key that opens the door to financial freedom! Removing clutter from your home and life has both financial and psychological benefits. It’s a way to reduce stress, simplify at home, and save more money because you’re not bringing in more stuff. Even better if you can have a yard sale and sell the stuff you don’t need! Regular and routine maintenance improves your savings and your skills! Just a few clicks on the Internet will give you step by step instructions and videos to fix just about anything. Before you throw away a vacuum cleaner or call a plumber, check to see if there may be a simple solution that will save you a lot of money. There are also regular maintenance routines that can keep your home and car in good condition. These are things like checking and/or replacing vents and filters. This helps to prevent small issues from becoming major, costly, problems. Recently I wrote an entire article on how to create a financial vision board. 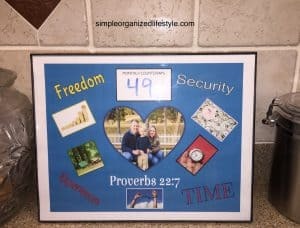 I believe that keeping your financial goals front and center on a vision board has the same effect as when you cross something off of your to-do list. The result is going to help you save more and live better. Another idea is to use a goal setting printable to track your financial progress. You can grab one here in the resource library. Writing down and seeing progress on our goals gives us momentum to keep going and achieve them. It’s a simple way to help turn our dreams into reality. 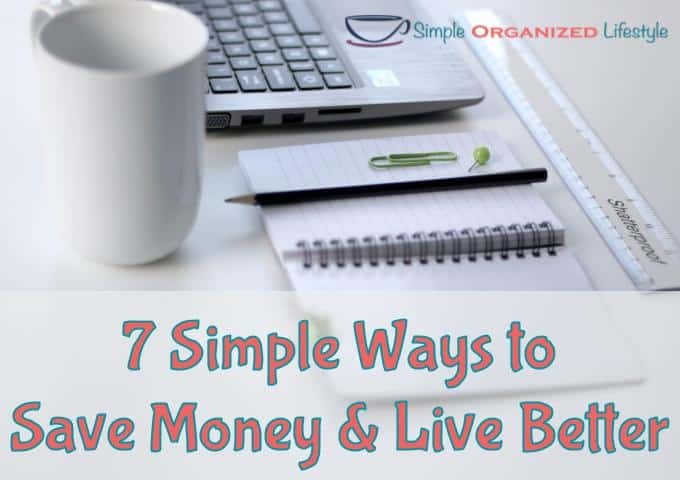 What simple ways have you found to save money and live better? Simple changes may seem too small to make a difference, but over time those changes will lead to big results! Cooking at home and decluttering by selling items is something I do on a regular basis to save money. I’ve also started using digital coupons and loading them directly onto my store loyalty cards so that I always get my shopping discounts. Doing a few of these simple things actually does help us live better! So true, simple and small actions add up over time! Thanks for commenting!